A Colonel of Truth: "MY DAD WAS A LANCE CORPORAL"
"MY DAD WAS A LANCE CORPORAL"
The weather forecast for Omaha, Nebraska last Thursday morning was for a clear sky and close to 90 degrees with high humidity by 1000. And I was seated amongst a big crowd in an uncovered area facing a couple of inert missiles built to deliver nuclear weapons, flags, a podium and two chairs - under the blazing sun. Fittingly, the cement and modestly landscaped area is, in naval lingo, referred to as the "missile deck." The occasion a promotion ceremony - a Sailor, a submariner, making the big step from Captain to Rear Admiral (Lower Half). He's a neighbor and friend. Despite the weather the occasion called for coat and tie. When clad to the point of selecting a tie I opened the drawer and was overwhelmed by a feeling to select a tie not worn in five or six years. Powerful and inexplicable that feeling. There was no decision. No hesitation. That tie. It was damn hot sitting in the sun and thoughts of why that tie haunted. Family did the honors of swapping out shoulder boards and cover. Then the general administered the oath. The new admiral had a few note cards but spoke mostly from memory and the heart. He talked about his dad and uncle steering him toward the Naval Academy. He talked about tough life as a midshipman - that included the untimely death of his dad. And how he struggled with the decision whether to continue or return home and help the family. His mom said stay in school. He talked about the family surname and how he came to understand and appreciate they are a family that is "comfortable being uncomfortable" - recalling a funny story of his wife's first introduction to the family. That comment struck a strong note with me because that's how I grew up and, too, Marines are comfortable being uncomfortable - for the business-as-usual training and practices of being miserable; a fact of service pride and bragging rights. In fact about a year ago in conversation with another submarine admiral and his wife handling miserable conditions came up. The admiral stopped his wife, laughed, and said, "Dear, you're talking to a Marine. You're not going to 'out miserable' Marines." Anyway, the new admiral next came out with something unexpected. "My dad was a lance corporal," he said. So now his comfortable being uncomfortable comment made sense. So did, however inexplicable, choice of necktie. And then he matter-of-factly and humorously opined he thought his dad would be proud he's an admiral but maybe slightly disappointed not a Marine general. Great advice! Easier said than done. At the reception, his wife gasped when mentioning the tie. And to the admiral advice remembered and passed along from a past Marine Corps commandant addressed in his Planning Guidance: No is easy. Find ways to say yes to Marines (changing Marines to Sailors). The admiral nodded with "thank you." Whatever the loss to the Marine Corps, (sub)marine Sailors are getting a superb admiral raised by a Marine. 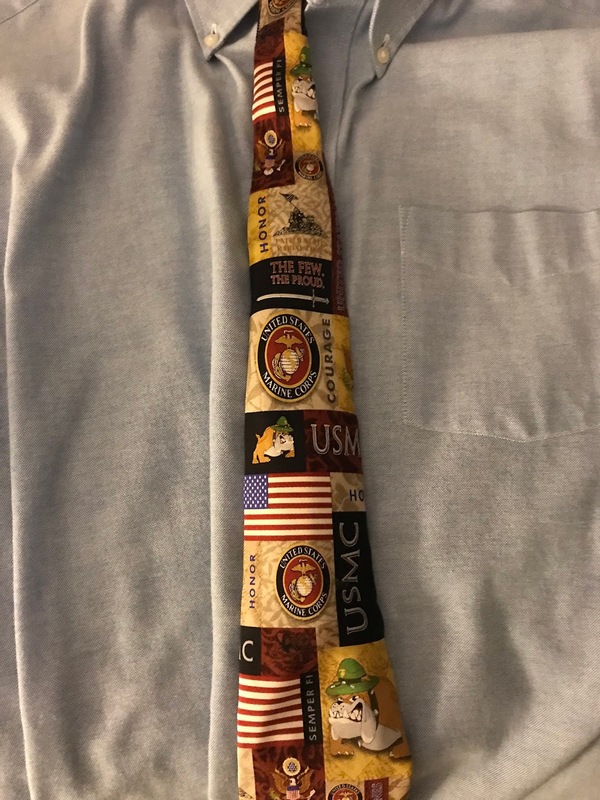 And somewhere out there in that vast still largely uncharted mysterious sea above there's a proud Marine lance corporal comfortable in overwatch - a necktie partial uncomfortable proof. Timely choices and timeless advice.